The present invention is essentially a method and system for leaving and retrieving messages at specific coordinate way points within a commercial mobile radio service (CMRS) provider network. Users carry or transport interface devices for communicating over the network and are able to record and view messages at specific coordinate locations while traveling in the network. The location of the device is calculated by the device or by the network while the device is powered on and in within the physical boundaries of the network, or through a combination of both. Messages can be made available to network subscribers when their interface devices come within an area centered about a physical coordinate location. Personalized messages can also be left by subscribers at any coordinate point within the boundaries of the network. The invention can also be used to facilitate access of information about an asset when a technician comes within a physical proximity threshold relative to said asset. …to leave “virtual post-it notes” or “virtual graffiti” nearly anywhere. The message could even be a reminder to left by a person for himself, or a video or audio clip. The patent also mentions that this system could be used to create “affinity groups” made up of other subscribers, which could be used to page people when other members of their groups are nearby, and message those members without that message being tied to a specific geographic location. Another aspect covered by these patent filings is the ability to leave messages for maintenance or inspection people to go to a particular site and receive information about that site, such as repair records, date of installation, schematics, inspection data, and repair instructions. The company that originally invented this process also worked on technology involving wearable computers, and unsuprisingly, the patent also suggests the possibility of using this technology for orienteering type games. Advertisers could include coupons with their messages to attract visitors to their businesses. This seems to have a lot of potential and is certainly something which would be useful for historical value as well as bus times. At the moment it is possible to get bus times in a message but not automatically. Is there any idea when this will be put into action? Google’s extended interaction with the real world seems to continue to gather pace. I’m not sure where this is all going but the Google of the future is evolving into some interesting areas; areas that go way beyond the SERPs and (traditional) SEO. Google also seems to be taking much more of an interest in mobile. Mobile could soon be the ‘next big thing’ after years of hype. Where do you see this all going Bill? 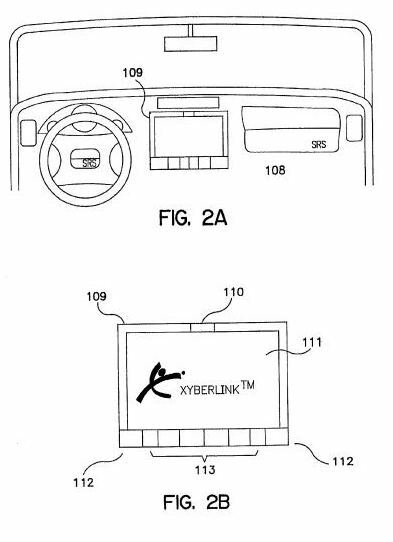 Where does this isolated patent fit into a general master plan (if there is one)? This seems both awesome and terrible. Getting historical updates on the area you’re driving through on a road trip would be really cool. The idea of being able to leave virtual graffiti in different locations is also really cool. My reservation lies in the possibility that the commercial messages could get out of control. It would be cool if they limited it to local businesses or something, but if it was actually open to any advertiser it could get really annoying, especially if the messages came through your phone and not just some kind of navigation device. There are some very interesting and potentially useful features in this system. I can’t give you a date on when Google might start to offer the things described in this patent, if ever, but it does present some interesting possibilities. I really like the historical and informational aspects described in the patent, but would probably be less likely to subscribe to advertisements, and to participate in the social aspect mentioned in the patent. Then again, I’m a big fan of local history, and it would be great to be given a historical tour of someplace I’m driving through. There have been a lot of statements from Google that they are focusing upon mobile products these days – even in many cases before developing desktop versions of application. Google acquired more than 40 companies last year, but they also seem to be targeting intellectual property from companies willing to license or sell that property. A lot of the recent patent acquisitions seem to involve mobile applications, which seems to make sense given the growth of mobile. A lot of people who might not have computers in their homes are increasingly buying smartphones and connecting to the web through applications and mobile browsers, or even navigation systems for their cars. If the same information can be used in many different ways, on many different devices, it makes sense for Google to collect that information and package it in different ways depending upon the need for it. For example, Google provides navigation systems for cars and mapping applications for phones for people traveling somewhere. The same information can be used by people looking for business and location information on their home computers and driving directions. Information collected from drivers about the routes that they take, their shortcuts and detours, the speed that they drive, and so on, can be monitored and used by Google to provide real time traffic estimates, gridlock information, and more for all Maps/Local users. From the patent, it seems that the focus would be on local advertisers, and that you could potentially choose what you subscribed to in a system like this, so that you might choose to see the historical and informational updates (or Graffiti), without the commercial messages if you wanted. Hopefully, if Google goes forward with this, that’s how they would set it up. Wow, very interesting. I have been out of the loop on this website lately, glad to see you are still busy like always! This is very interesting. I’m quite worried however on the part where having this freedom may go out of control. There are still many uneducated users who tend to abuse such a capability. Great post though. I’m sure to follow the progress of this topic online. With cars that can now drive themselves, I think that Google may want to enrich (and monetize) our travel time. Thanks for that info about car driving themselves. I have been amazed for years that this hasn’t already happened considering we have sat nav and cruise control surely it can’t be that hard to put the two together. Now we have this new google virtual post it note, we really could go on our own historical tour without having any work to do lol. I’ll be keeping an eye out for more on this topic as well. There does seem like there might be some potential for trouble with something like this, but it looks like the ability to provide messages like this will be tied to specific user accounts. That might help. Google also offers driving and transit directions, has a few patent filings on helping manage fleet services, contacting taxi cabs, and navigation systems. Google Maps and Streetviews also focus upon locations as well. There seem to be a lot of pieces that could be tied together, along with a growing number of mobile services that Google offers. Next Next post: Will Google +1 Web Page Buttons also be Share Buttons?